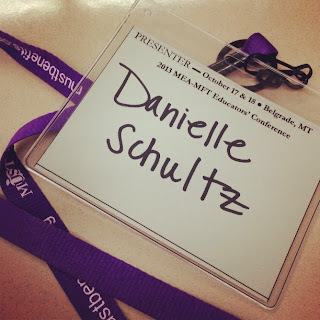 It is hard for me to believe that a week ago I was in Montana presenting at the Montana Education Association and Montana Federation of Teachers (MEA-MFT) Educators' Conference. I am so excited that the Montana School Counselor Association invited me to be a keynote speaker and presenter for the conference. A HUGE THANK YOU to Alicia Godfrey for showing me a great time in Bozeman! My keynote titled You Are Not Alone: Connecting Through Social Media was about how school counselors can utilize Twitter, Facebook, Google+, and blogs to communicate with other school counselors professionally and create a professional learning network. I also presented two breakout sessions at the MEA-MFT Educators' Conference. In my session Blogging in 5 Easy Steps I explained the benefits of blogging as a school counselor and showed participants just how easy it is to create a blog and start posting. In my session Tech Savvy School Counseling, I shared various technology tools that school counselors can utilize for professional development and to enhance their school counseling program. 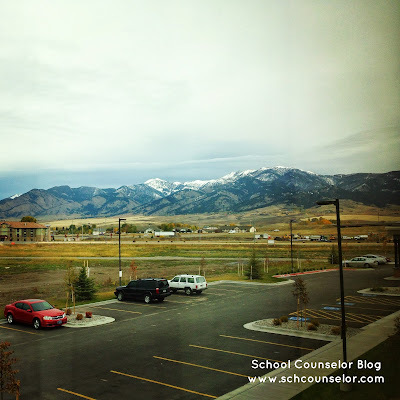 I had a excellent time talking to Montana school counselors and sharing tech tools and tips with them! Montana is so beautiful! I couldn't get enough of the snow-capped mountains! To see more pictures from my trip follow me on Instagram. While at the MEA-MFT Educators' Conference I learned some great information from other presenters. I created a Twitter hashtag to catalog the tweets I shared during the conference. I made my tweets into a Storify below so that you can access the links and resources I shared even if you don't have a Twitter account. Right after the MEA-MFT Educators' Conference, I headed to Denver, CO to present at the ACES Conference with my doctoral cohort. It was a whirlwind weekend! Are you attending any upcoming conferences? What is your favorite part about attending a professional conference? 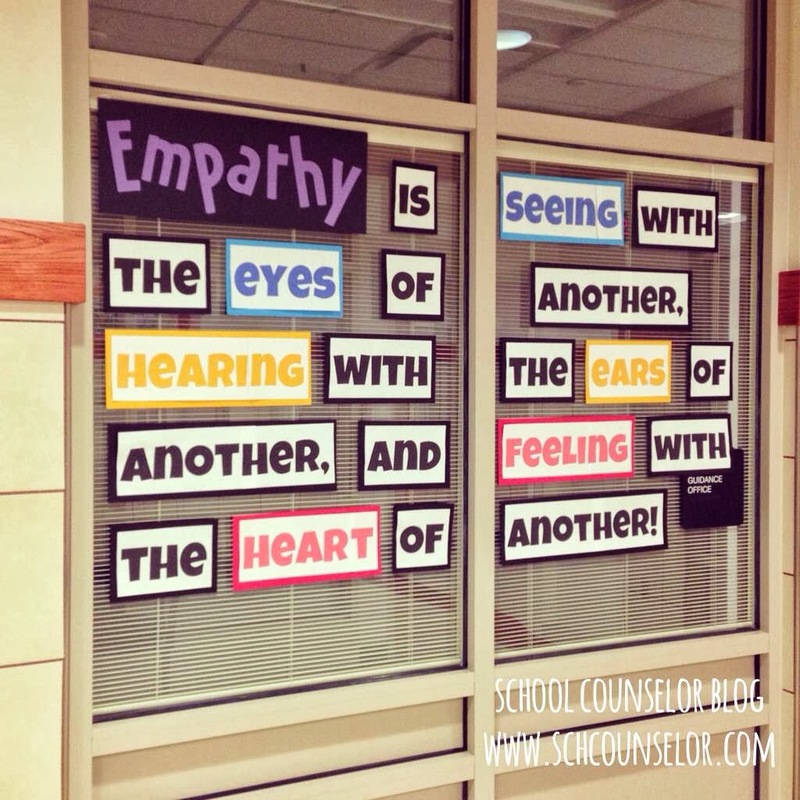 Empathy is our character education theme for October. I wanted to create a visual display somewhere related to empathy, and thought that one of the remaining "free" windows of the counseling suite would be the perfect place. 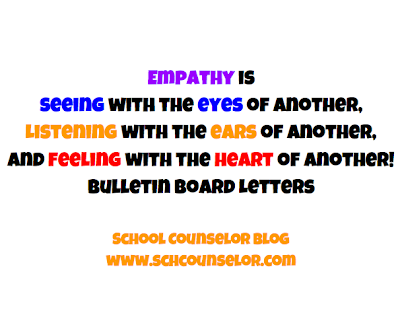 Jen, a school counseling intern who is working with my co-counselor, found a great quote related to empathy. We created a colorful bulletin board on the windows to the left of the entrance of the school counseling office area. I love how it turned out! To make the bulletin board, I typed the quote into Google Docs using the font "Luckiest Guy." We printed the words on plain white paper, cut them with a paper cutter, and then glued the words to black cardstock or colorful cardstock. We made the word "EMPATHY" using my Cricut paper cutter. Tip: If you use 12 x 12 cardstock and cut it in half with a paper cutter, the cardstock will be the perfect size for gluing on the words! I created a Google Doc so you can print the whole quote! Click on the words below to for access to the Google Doc. *Note - the original quote states "listening" instead of hearing. I didn't realize until after we were done gluing and hanging everything that I wrote "hearing" instead of "listening." I was going to fix it, but then we didn't have enough space to put listening, so we left it as is. If you would rather put "hearing" like the bulletin board we created, you can save a copy of the file and edit it in Google docs. Do you host different character education themes each month at your school? How to you create programming around the theme or support the theme at your school? 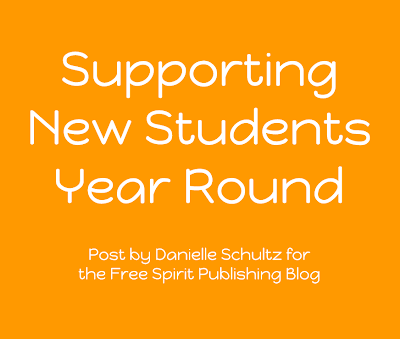 In my latest post for the Free Spirit Publishing's Blog, Supporting New Students Year Round, I share tips and information for school counselors and educators to welcome new students, even after the school year has begun. What tips do you have for helping welcoming new students to your school throughout the year? Our October #SCCHAT was held on October 1, 2013. The topic of the chat this month was Bully Prevention Month Ideas: K-12 moderated by Dr. Susan Fuller (@EElementarySC‎), elementary school counselor and author of the Entirely Elementary School Counseling blog. School counselors shared tons of ideas and resources for celebrating Bullying Prevention month at all levels, K-12. Join us for the November #SCCHAT on November 5, 2013 at 8pmEST! The topic is Lesson Plan Creation and Implementation and will be moderated by Chris Wood (@ChrisWood415), high school counselor form Iowa. We will be chatting about ideas and resources for developing and implementing lessons plans as a school counselor.